ISLAMABAD, JAN 18 (APP): Finance Minister, Senator Mohammad Ishaq Dar said Wednesday that the government was extending maximum facilitation to Private Sector to enable it play its due role in increasing economic opportunities for the people. American Tobacco (BAT) led by Jack Bowles, Director Asia Pacific Region that called on him. economy can grow without the participation of the business community. “After achieving macro economic stability, he said, the government is more focused on economic growth,” Dar said. production and smuggling of illicit tobacco products and would continue to pursue this course. company’s business in Pakistan and around the globe. the measures taken by the Government to curb illicit trade of tobacco products in the country. This would facilitate legal and quality tobacco business as well as ensure proper taxation of such businesses. 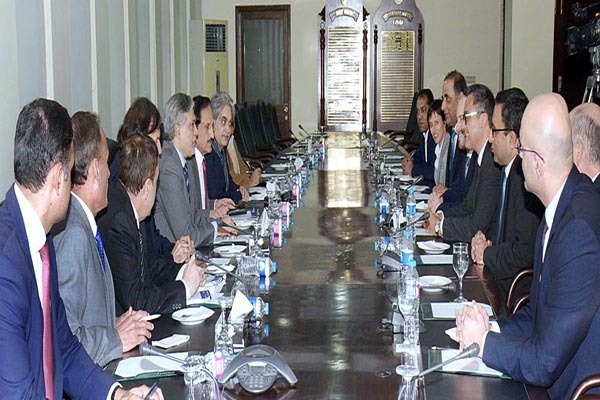 The meeting was attended by the Special Assistant of the Prime Minister Haroon Akhtar Khan, Chairman FBR and senior officials of the Ministry of Finance and FBR.